The German international has suffered numerous problems throughout his career and opened up about the mental anguish he has been put through. 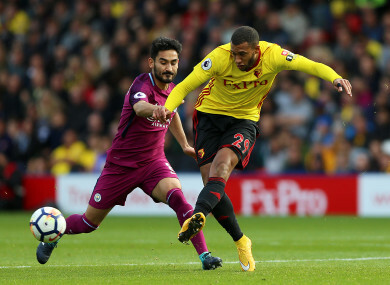 Gundogan with Watford's Etienne Capoue last weekend. MANCHESTER CITY’S ILKAY Gundogan has admitted he may never return to his previous level as a player after his injury troubles. The midfielder played his first game of the season for City when he came off the bench in the second half of Saturday’s 6-0 win over Watford in the Premier League. Gundogan made just 16 appearances in all competitions last season, having picked up an injury shortly after his arrival from Borussia Dortmund and latterly suffering a cruciate ligament tear. Injuries have been a constant issue on the 26-year-old’s career and he admits that he may never get back to his best after the latest upset. “There are doubts if I will be again at the level I had before so, of course that is the case,” he said. ”Because of these ups and downs, more of the downs, it is sometimes frustrating. “The doubts are at this point even bigger. But I had no other choice. I am a football player. This is what I do. This is what I have done all my life. This is my job. For me, there was no other choice than to try again. If I said I am the same player as I was a year ago, I would be lying. I mean, through the injury, you don’t feel the same. You don’t feel as though you are the most powerful guy in the world — not that I ever did. I had two injuries on my knee and I know what to do to prepare myself for the games and to warm my knee up and be generally fit. The long spells on the sidelines have had an effect on the Germany international, but was determined to return to action. “It was a long wait — and tough as well,” he added. “That is why it feels so special to return. I was sad just to watch in front of the TV or in the stands. I am used to playing every three or four days. If an injury takes it away then it is always disappointing and it feels weird. “The worst time was of course the day of the injury or when I knew what exactly happened. When I knew there would be six, seven, eight, nine months out. That was the worst feeling. “The day after the surgery was not so good either. But then, at one point, you start to do it again. You start to do your rehabilitation. You recover. You have ups and downs, days you feel better, days you feel very bad. I think that is normal. It is not just me. Are ‘the old Manchester United’ finally back? Email “Injury-ravaged Man City midfielder Gundogan admits he may never be the same player again”. Feedback on “Injury-ravaged Man City midfielder Gundogan admits he may never be the same player again”.